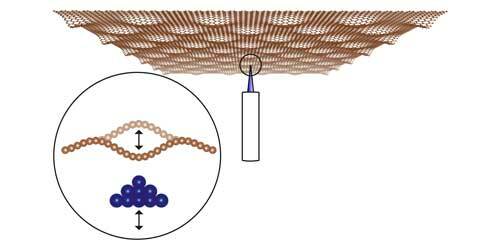 (Nanowerk News) An international team of physicists, led by researchers at the University of Arkansas, has observed spontaneous mechanical buckling in freestanding graphene using scanning tunneling microscopy, indicating it has potential to be a new electronic power source. The discovery advances the understanding of graphene, a two-dimensional material that is a mere single atom in thickness, and its potential role in the development of next-generation electronic devices. The research team published its findings Tuesday in Physical Review Letters ("Anomalous Dynamical Behavior of Freestanding Graphene Membranes"), the journal of the American Physical Society. The discovery was also highlighted on the society’s Physics news site. The researchers used scanning tunneling microscopy, which produces images of individual atoms on a surface, to demonstrate the spontaneous mechanical buckling. The finding opens a new field of research in the study of dynamic behavior of freestanding two-dimensional materials controlled by scanning tunneling microscopy, said Paul Thibado, professor of physics at the U of A who led the study. The researchers found that the buckling movement correlates to a phenomenon known as a “Lévy flight,” named for the French mathematician Paul Lévy. Lévy flight refers to a random walk process in which long excursions occur with higher statistical probabilities than a normal system in constant random motion. Lévy flights are common in biological systems and accurately model animal foraging patterns. The phenomenon hasn’t been observed at the atomic-scale with an inorganic system until this study, Thibado said, making it possible to predict and control long excursion events. “Buckling events in 2-D materials hold the key to understanding the phenomenon of Levy flights,” he said. Freestanding graphene’s continuous motion, augmented by the high kinetic energy of these random inversions, could be converted into electrical current and used in place of batteries to power small electronic devices, Thibado said. There is an urgent need for the development of power sources other than batteries, especially as wireless sensor networks that connect non-computer objects to the internet grows. Such wireless sensor networks are collectively known as the Internet of Things, such as running shoes that provide performance feedback to an athlete or a “smart” irrigation system that monitors and reports moisture levels of distant fields. Surendra Singh, professor of physics at the U of A and a co-author of the study, helped identify the connection between Lévy flights and the statistical properties of the system. Co-author Pradeep Kumar, assistant professor of physics at the U of A, provided insight into developing the molecular dynamics simulation, which proved that the mechanism for the long excursions was mechanical buckling. The study was conducted primarily through a research partnership between the U of A and the University of Antwerp in Belgium. The results were obtained through a collaborative effort with U of A physics graduate Matthew Ackerman and Mehdi Neek-Amal and Francois Peeters of the University of Antwerp.